If you are an investor looking for true passive income with safe, consistent, predictable returns, then net leased properties to investment grade corporate tenants could be one of the best fitting solutions you can find. Financially savvy individuals know what a vital role real estate plays in their investment portfolios. Those with experience also know that how they invest in real estate and what they invest in makes all the difference in meeting their investment goals. This is a prime opportunity for entering the investment grade property market. These choice investment properties have historically been under the control of the ultra-wealthy investor, large financial institutions, and investment funds; but now informed individual investors are gaining access to this true source of passive income. From high net worth medical professionals to well-versed accountants, from successful entrepreneurs to accredited investors, investment grade income properties have become a must have real estate portfolio allocation. There are many reasons for this. One of the main benefits being that investment grade income properties offer a truly hands-free management experience in addition to reliable returns. As a successful high achiever, you know that time is your most valuable asset. For busy professionals that crave the ideal combination of life balance and investment success, these are a smart investment to explore. They strike a perfect point between safety, high returns, and passive income. It’s ideal for individuals desiring a superior alternative to REITs and stocks. It’s also a reliable direction to turn to for those who need to restructure their portfolios to avoid a loss in changing markets or to accelerate gains and boost surplus income in preparation for retirement. Investment grade income properties can even be a much-needed upgrade for existing real estate investors who are tired of the work, competition, and lack of consistency in residential homes and multifamily investing. You can have direct ownership of the same key core assets as the six largest REITs within the net lease sector: National Retail (NYSE:NNN), Realty Income (NYSE:O), Spirit Realty (NYSE:SRC), STORE Capital (NYSE:STOR), VEREIT (NYSE:VER) and W.P. Carey (NYSE:WPC).These REITs, which account for nearly $50 billion in market value, are holding over 16,000 total properties. These REITs generally rent properties with long-term net leases (10-25 years) to high investment grade credit-quality tenants. “Net lease” refers to the triple-net lease structure whereby tenants pay all expenses related to property management including property taxes, insurance, and maintenance. Triple-net leases result in long-term, relatively predictable income streams. The long-term leases are what have made the performance of this sector very durable and recession resilient. The actual individual assets that these REITs hold vary by size, geographical focus, and quality focus. The “quality focus” is based on the credit quality of the tenants. High quality tenants tend to be larger, more established companies with investment-grade credit ratings. You can get access to these investment grade credit ratings below. Now individual investors like you can own the same underlying assets that these REITs target. The advantage of direct ownership over REITs is that you ensure that 100% of your invested capital goes directly into real estate. REITs carve out significant management fees for themselves. This is particularly evident on some non-traded REITs where only 85% of the capital invested makes it directly into real estate. The rest goes to fees and trust overhead. It is also important to note that the Internal Revenue Service does NOT qualify REIT dividend distributions as passive income, but instead as ordinary income. Dividend distributions for tax purposes are allocated to ordinary income, capital gains, and the return of capital. Each which may be taxed at a different rate. It’s not just REITs that love this sector. Some of the world’s largest alternative funds are supported on a foundation of commercial property leased to investment grade corporate tenants. That includes Blackstone, Norway’s Sovereign Fund, the Queen of England’s Crown Estate, and Canada’s pension funds. Prime American property with national credit tenants are among their favorite investments too. America’s top university endowment funds, which control over $500 billion in assets, have also made a significant shift away from stocks and EFTs to alternative assets like real estate. These assets now make up as much as 57% of the portfolios of the most wealthy endowment funds, according to the National Association of College University Business Officers (NACUBO). This includes the likes of Harvard, Stanford, MIT, Yale, the Gates Foundation, and CalPERS. It has made billions for them. It will preserve their wealth and legacy for generations. Direct investment in triple-net leased income properties with national investment grade credit tenants can deliver all the benefits of REITs, but with with 100% of your capital being invested. You have more control. You have true passive income coming in on autopilot every month. The tax benefits are better, the wealth preservation and gain potential are better, and you have complete control over what you are investing in. It’s no secret that recently many residential investors have been graduating to commercial real estate. Major market forces pumped, dumped, and pumped the housing market again. Individual investors bought into the HGTV reality show revival. Many have done very well. Now interest rates are trending up and competition for single family homes is at unbalanced proportions, with as much as 30% of home sales going to investors. Finding profitable single family and small multifamily profits are a challenge. Even those who are still successfully operating in these other asset classes are seeing the wisdom, efficiency, and superior benefits along with the truly passive returns this sector has to offer. At a minimum, it is an essential point of diversification. Even if you have been able to find an apartment building with good cash flow, there is a whole lot of time and effort needed to keep the income stream stable. You have to keep up with repair issues and scheduled maintenance while staying within a tight budget. You have to find, qualify, and manage all of your tenants. That includes handling complaints and evictions. While you can outsource the day-to-day management, you can expect to pay out an additional 8 to 10 percent of your hard earned income. When you own an Investment Grade Income Property there is no need for property management. It’s all handled for you. The tenant stays for decades. And you get to keep your 10 percent. With Investment Grade Income Properties, you will have your corporate tenant guaranteeing a lease for very long term (often from 10-25 years). This is a critical benefit, given that most residential real estate investors waste both significant time and money filling annual vacancies. One of the biggest benefits of Investment Grade Income Properties over both multifamily and most other commercial rentals is that you will NOT have variable operating expenses. On a properly structured triple net leased investment property you get a net operating income (NOI) that you can count on. It is not a estimate or best guess like in most multifamily properties. You earn a predictable, consistent, true passive income stream. Why Investment Grade Income Property ? Income properties backed by Investment Grade Corporate Tenants yield very attractive risk-adjusted returns. Unlike most stocks, Investment Grade Income Properties generate consistent cash flow. Investment Grade Properties give you a variety of choices and solutions to meet your most pressing concerns and investment goals. Investment Grade Investments are rooted in real property – tangible assets you can see, touch, and drive by. Unlike the stock market, which is often priced on vague factors and speculation, with Investment Grade Income Properties you will know exactly what you’re investing in. There is no need for property managers or hefty layers of fees and commissions that deplete your net returns. Done right, you can get all the benefits of investing directly in truly turnkey real estate, without any of the headaches of managing, dealing with tenants, or handling the maintenance yourself. You get ease of investment, clarity, and rock solid collateral. The Credit Ratings of Investment Grade Corporate Tenants are important because they can effect the Cap Rate, Financing, Pricing and ultimately the Rate of Return. 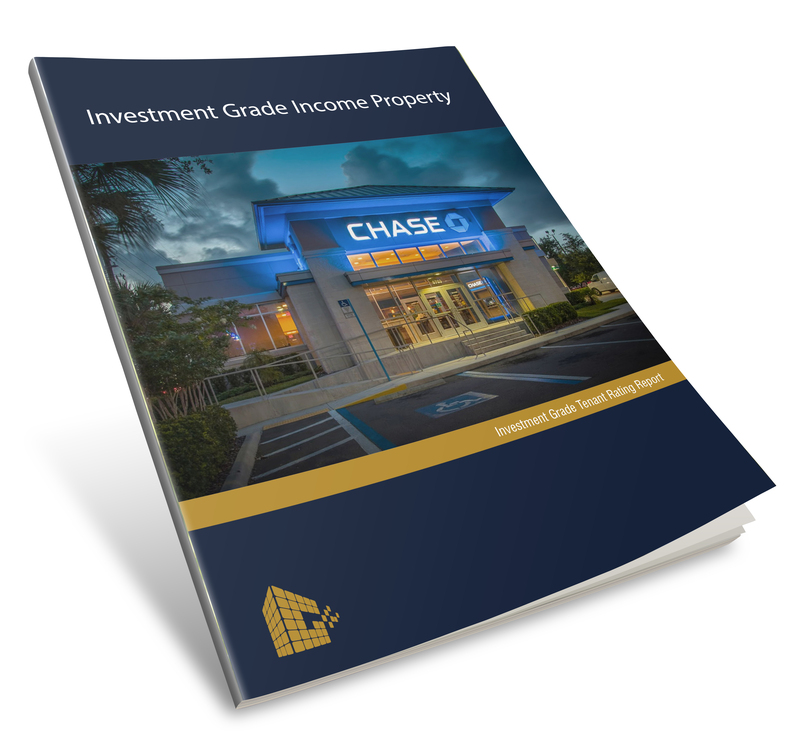 When you register for the White Paper: How to Earn Passive Income From Investment Grade Corporate Tenants, you will also receive our Investment Grade Credit Rating Report detailing scores on over 150 corporate tenants. This isn’t just about picking good properties. 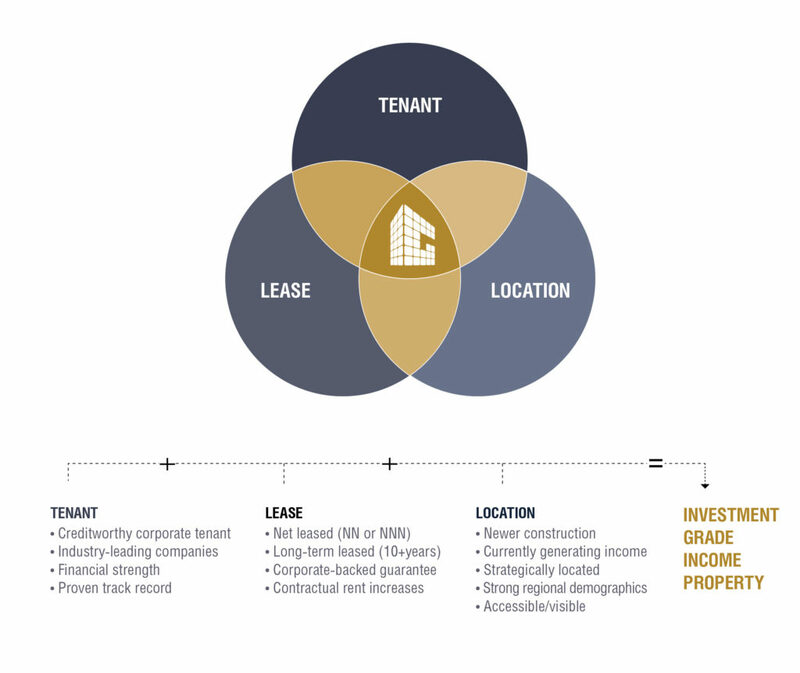 Investment grade tenants are typically triple net (NNN) lease tenants. Imagine some of the most trusted and national brands like Starbucks, FedEx, CVS Health, Dollar General, McDonald’s, Chase Bank, Panera Bread, Whole Foods and others guaranteeing your investment income for the next 10 or 20 years. Even better, imagine that they pay all the bills too! In a typical commercial real estate deal the owner still covers capital improvements. Though under an Absolute Net lease the tenant even pays for that too! Investment grade tenants are independently evaluated and rated on their size and financial strength. They handle the maintenance and they aren’t going to be calling you to unclog toilets. So you get to keep that 10 percent which is often lost to a property manager. The long leases provided by corporate tenants dramatically lower expenses for property owners, while increasing net gains and reliability. The icing on the cake is that even in the worst case that one of these tenants should want to move, they and their larger pool of corporate resources are on the hook to pay the balance of the lease. That can be even better for you as an investor. There is a lot of prestige and pride of ownership that comes with having these types of properties and tenants. If you ever decide to sell, the property’s resale value will be much higher with a long-term corporate-grade tenant. You Will Learn How to Use 1031 Tax Deferred Exchanges as both an Exit Strategy and to Slash Capital Gains to Zero ! Combining the purchase of an Investment Grade Income Property with a 1031 exchange is an ideal tax reduction tool and an excellent wealth preservation strategy. A 1031 exchange is a tax reduction provision that allows an investor to sell their investment properties and “exchange” them for another like-kind investment without incurring any capital gains taxes. This creates a significant tax shelter for real estate investors, especially considering that all of the state and federal taxes on the realized gain from a property sale can take 35 to 40 percent of your net profit. Utilizing a 1031 exchange to exit from your current property investments and upgrade to this new asset class will allow you to reinvest all of your cumulative cash flow and equity build-up. With the correct tax strategy, you will be able to defer your capital gains taxes indefinitely. Deferring all Capital Gains Taxes. This also includes the depreciation recapture tax. Consolidating Investments. You can trade-up an unlimited number of unwanted rentals into an Investment Grade Income Property. Diversifying your Portfolio. You can shift your portfolio into another asset class or geographical location without any tax consequences. Simplifying Management. You can exchange a management-intensive income property for a true passive NNN investment opportunity. Preserving your Estate. Your heirs can inherit your investment portfolio tax-free. When a 1031 exchange is applied within a self-directed retirement account, the tax benefits are compounded even further. The 1031 exchange will protect your net profit from capital gains and depreciation recapture taxes and a well chosen self-directed retirement account will allow your income distributions to be tax-free. In this way you can protect both your income stream and your net profit. Holding an Investment Grade Income Property in this type of portfolio is an ideal way to guarantee retirement income and value appreciation now and for all your future generations. plus Access to Capital Funding for Your Acquisition ! For decades, the Investment Grade Income Property market was a closed industry with limited access provided to only the super-wealthy, large financial institutions, and investment funds. Not anymore. The door has opened up to the individual investor such as yourself. This core investment asset offers excellent opportunities for astute buyers. When you register, not only will you learn about the nuances of Investment Grade Income Property net leases, but you will also gain insider access to Investment Grade Property deals from around the country. Finding properties in a competitive marketplace can be a challenge, but you will discover how you can gain an immediate advantage as a preferred buyer and profit from these properties. Plus! Your free registration will also give you access to sources of debt and capital that specialize in properties leased to credit-rated investment grade corporate tenants. These specialty lenders include niche banks, portfolio lender ,private equity investor, pension fund & insurance companies. This handbook will guide you through the process of building your own diversified real estate portfolio in this proven real estate asset class. Register now to immediately gain access to all of the information and resources you need to secure a truly passive income investment. ARE YOU READY TO IMPROVE YOUR PORTFOLIO? As a high achiever demanding the best possible performance from your portfolio, Investment Grade Income Properties are an essential component to consider. It is the stronghold of the wealthy, and a critical underlying asset for some of the longest lasting mega-funds and investment trusts. Yet, even as an individual investor, these investments may be available to you. It is even more so when you are given the ability to restructure existing retirement accounts, utilize 1031 exchanges, and secure attractive financial leverage. If you are interested in predictable returns and true passive income with rock solid collateral, then you owe it to yourself to learn more. If attaining true passive income with an investment that you will be proud of is important to you, then register for this free guide and discover your options. GET YOUR FREE GUIDE ! We help investors find, fund, acquire and exchange Investment Grade Income Property to established corporate tenants on long term net leases. We focus and specialize on investment grade real estate. Our industry research and expertise allows you to learn about and access the best sectors, tenants, and opportunities normally reserved for institutional investors.